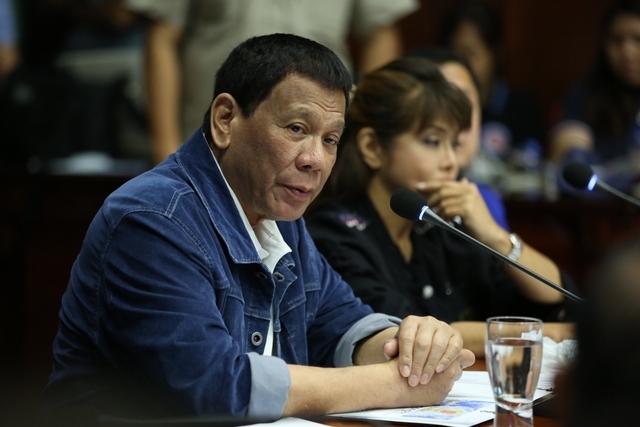 MANILA – President Rodrigo Duterte on Monday said it is time for the Department of Environment and Natural Resources (DENR) to take a second serious look on the mining practices in the country. Duterte made the remark in the wake of a landslide that hit a mining site in Itogon that left 34 people and 42 missing at the height of Typhoon Ompong. “That mining thing has really contributed a lot of heartaches for the Filipino people. It is time for us, particularly the DENR, General (Roy) Cimatu, to take a second look seriously now regarding the dangers of open pit mining,” Duterte said in a command conference held to assess the damage of Typhoon Ompong in Cordillera Autonomous Region (CAR) at the capitol building in La Trinidad, Benguet. “Though I must admit that we earn about 70 billion a year. And if you’re ready to accept that as a good, as a profit, let us make it simple for the country, but in the end, how much do you lose in the process?,” he added. Duterte said he would someday confront Congress to close the mining industry to “give the mother earth respite”. Before the command conference, Duterte visited the families of the landslide victims. Special Assistant to the President (SAP) Christopher "Bong" Go informed Palace reporters that PHP25,000 worth of goods and funeral and burial assistance plus PHP20,000 cash will be given to the families of the landslide casualties. Duterte commended all the local officials particularly mayors and governors of the typhoon-affected areas for lending their cooperation during the typhoon’s onslaught. He also thanked the military and police personnel as well as other individuals who are working hard work “to serve the people” particularly those who remain missing. In a separate press conference on Monday, Cimatu announced that he has officially ordered the suspension of all small-scale mining operations in CAR “to prevent further danger in lives of small-scale miners”. Cimatu said the Armed Forces of the Philippines and the Philippine National Police will send troops to CAR “to effect this stoppage of all mining activities especially here in Itogon”. He repeated his cease and desist order in front of the President, calling on the small-scale miners to cooperate and stop all mining activities in the region. In the same press briefing, Presidential Spokesperson Harry Roque assured that the national and local governments will not stop the search and rescue operations until all the missing people are accounted for. “Patuloy ang (We will continue) search and rescue efforts particularly in Itogon. Hindi tayo titigil hanggang hindi naa-account ang lahat (We will not stop until everyone is accounted for),” Roque assured. Presidential Adviser for Political Affairs Francis Tolentino informed the President that the around 12,000 miners bound to be affected by the small-scale mining suspension will be provided with emergency employment and livelihood assistance. In his third State of the Nation Address (SONA) last July, Duterte warned the mining industry not to destroy the environment, saying environmental protection is one of his government’s priorities. “To the mining industry, I say this once again and maybe for the last time, do not destroy the environment or compromise our resources; repair what you have mismanaged,” Duterte said in his SONA. “Try to change management radically because this time, you will have restrictive policies – a prohibition of open-pit mining is one,” he added. During his visit in Ilocos Norte on Sunday, Duterte said he is “hell-bent” on stopping destructive mining in the country. “I pity my country. And if I do not decide really to stop it. Although we are earning PHP70 billion in taxes in mining. But if you compare it with the destruction and on the long term, our children will suffer,” Duterte said. “Mining must stop. And if I cannot stop it during my time as President, nobody can. Because it’s big business and the pressure is just too great,” he added. He said destructive mining would “result in a perdition for the country”. Duterte said open-pit mining operations have created holes like bottle cap on lands which caused for soil erosion and other environmental hazards. On Tuesday, Duterte is scheduled to visit Isabela, another "Ompong"’s hard-hit provinces in northern Luzon.